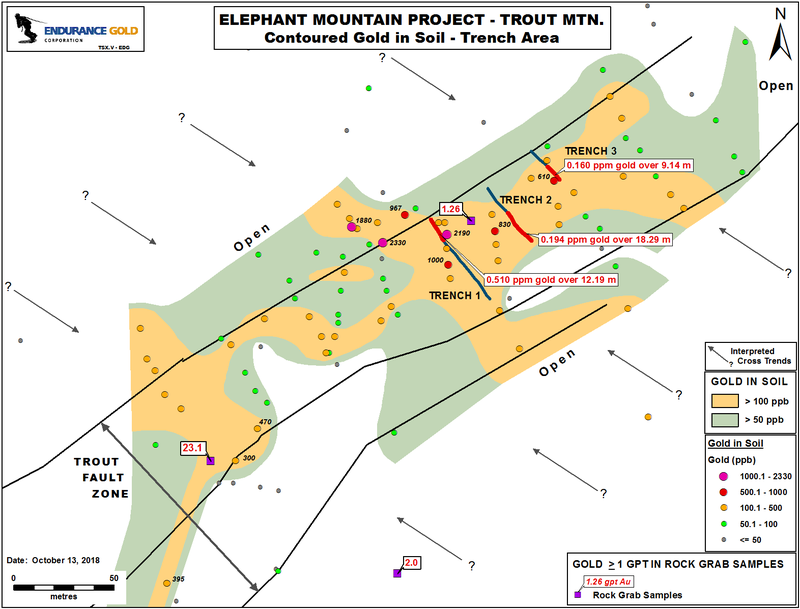 Endurance Gold Corporation (EDG -- TSX.V, "Endurance") is pleased to announce results from the recent summer exploration program of rock sampling, trenching, soil sampling and geological mapping primarily on the Trout Target within the Elephant Mountain Gold Project. 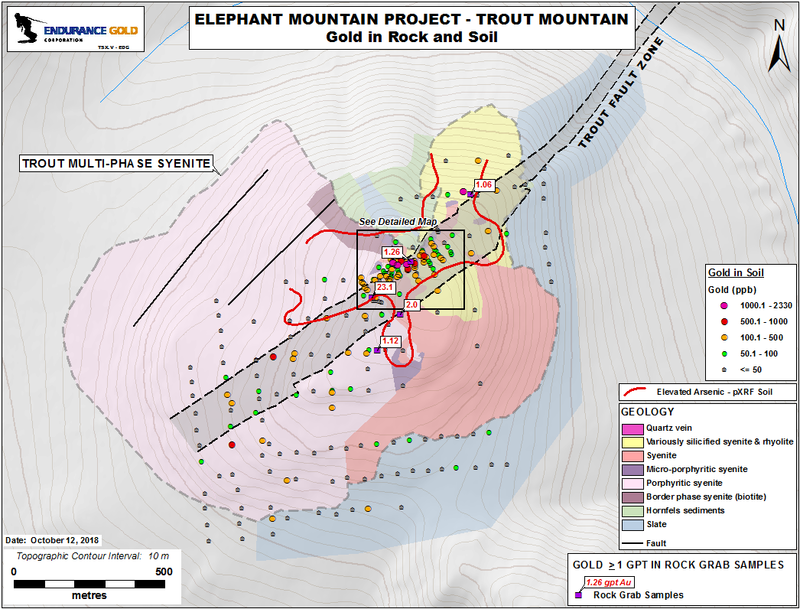 The 100% optioned Elephant Mountain Gold Project is located in the Rampart-Eureka-Hot Springs placer gold mining district near Eureka, Alaska. The southeast end of the Elephant Mountain Gold Project area can be accessed by the all-weather Elliott Highway about 76 miles (123 kilometres ("km")) northwest of Fairbanks. The northeast end of the project, in the area of the Trout Target, is accessible by historic gold rush trails into the Quail Creek placer gold camp. The Trout Target area is drained by the placer gold bearing South Fork and Bonanza Creeks, tributaries of Quail Creek. The Trout Target represents a greater than 100 ppb gold-in-soil anomaly that has been defined by prior soil sampling over approximately 1,200 metres ("m") of strike and hosted within a multiphase syenite intrusive ("Trout Syenite") (see Figure_Trout Geology, Soils and Rocks). A portion of the Trout Target soil geochemical anomaly has been the focus of additional detailed surface related exploration activity during 2017 and 2018. 2018 activity in this area included rock sampling, trenching, soil sampling and geological mapping (Figure_Trout Detailed Geology, Trenching, Soils and Rocks). Rock Sampling - To date five rock samples within the Trout Syenite have returned gold grades exceeding 1 gram per tonne ("gpt") gold. In the area of the higher gold-in-soil values, one grab sample returned 23 gpt gold associated with silicified syenite which is the highest gold-in-rock value sampled to date from the Trout Target. This rock sample was collected within an area defined by gold-in-soil values of 470 ppb, 300 ppb, and 395 ppb gold. Trenching was not possible in this area due to large boulders on surface. Trenching -- On the topographic peak, about 160 m northeast of the 23 gpt gold-in-rock sample, three hand dug trenches, spaced approximately 30 m apart, were completed in the area where 2017 soil sampling had identified gold values in soil exceeding 800 ppb gold. The area has not been glaciated and thus gold-in-soil anomalies were interpreted to represent reliable bedrock targets. Hand excavated trenching conditions were challenging due to lack of heavy equipment and the presence of frost transported boulders which limited ability to continue trenches past observed alteration in the trenching. Trench 1 intersected weathered bedrock associated with the 2017 soil samples that analyzed 1,000 and 2,190 ppb gold. Assays from Trench 1 channel sampling include 0.51 gpt gold over 12.19 m associated with primarily oxidized and weathered pervasively silicified fine grained to porphyritic syenite with quartz veinlets throughout the mineralized interval. Trench 2 and Trench 3 had less success in achieving weathered bedrock over their excavated length, but channel sampling did encounter anomalous gold values in similar weathered bedrock of 0.194 gpt gold over 18.29 m and 0.16 gpt gold over 9.14 m, respectively. All three trenches had gold-enriched bedrock zones which remain open to expansion past the end of the trenches. The gold values returned from weathered bedrock in the trenches did not identify mineralization which adequately explains the higher tenor of gold in the nearby gold-in-soil samples. Soil Sampling - During 2018, additional infill soil sampling was completed over about 300 m of strike at the main Trout Target to better define the areas of the highest gold-in soil and to help with interpretation of controls to mineralization. This sampling continues to indicate a greater than 100 ppb gold-in-soil anomaly trending northeast to southwest exceeding 300 m of strike and also exceeding at least 35 m width, past the area of detailed soil sampling. The greater than 200 ppb, and especially the higher gold values exceeding 500 ppb gold indicate a possible subsidiary northwest to southeast sub-trend within the northeast trending +100 ppb gold-in-soil anomaly (see Figure_Detailed Trench Area_Contoured Soil Sampling). This suggests that the higher grade bedrock source structures maybe at an oblique angle to the 2018 trenches and may not have been intersected with the 2018 trenches. Geological mapping -- Mapping of the Trout Syenite has identified a multi-phase porphyritic syenite intrusive encompassing subcircular dimensions at surface of about 1.7 km by 1.2 km. Within this area a 600 x 300 m area of hornfels sedimentary host rock is interpreted to be capping the north-central portion of the Trout Syenite. Hornfels is clastic sedimentary rock recrystallized and altered by intrusive activity. Within this area geological mapping has identified a 600 x 350 m zone of variously silicified fine-grained felsic to syenite intrusive ("Silicified Syenite") adjacent to the hornfels. Geological mapping has also identified a northeast striking zone of shearing and faulting over a strike length of about 1.5 km and width of about 150 m ("Trout Fault Zone") hosted within the Trout Syenite. The Trout Fault Zone continues outside the Trout Syenite but within the Trout Syenite complex is observed to be coincident with the trend of the greater than 100 ppb gold-in-soil anomaly and also associated with anomalous arsenic identified with pXRF supported mapping. In total length, the Trout Fault Zone was observed over approximately 4 km of strike. At about 2.0 km northeast of the trenches in the Trout Syenite, the Trout Fault Zone transects the area of the South Fork Gold prospect identified with 2017 sampling (up to 10.35 gpt gold in grab samples). 2017 trenching and chip sampling at South Fork returned 0.547 gpt gold over 4.57 m from one area of quartz vein breccia and quartz-vein stockwork in slate and hornfels (see company press release dated October 18, 2017). Next Steps -- The Trout Target geochemical anomaly remains open to further detailed soil sampling southwest and north north-east of the 2018 trenching area. Further work is required to identify the syenite-hosted bedrock source for the 23 gpt gold sample. The trenching indicates gold mineralized bedrock remains open to expansion in width in the current trenches. All these areas contain several gold-in-soil samples in excess of 500 ppb in a broader +100 ppb gold-in-soil anomaly which indicates potential for additional sub cropping gold mineralization over a larger area. The Trout Target also warrants diamond drill testing to evaluate the full extent of this gold mineralized system. 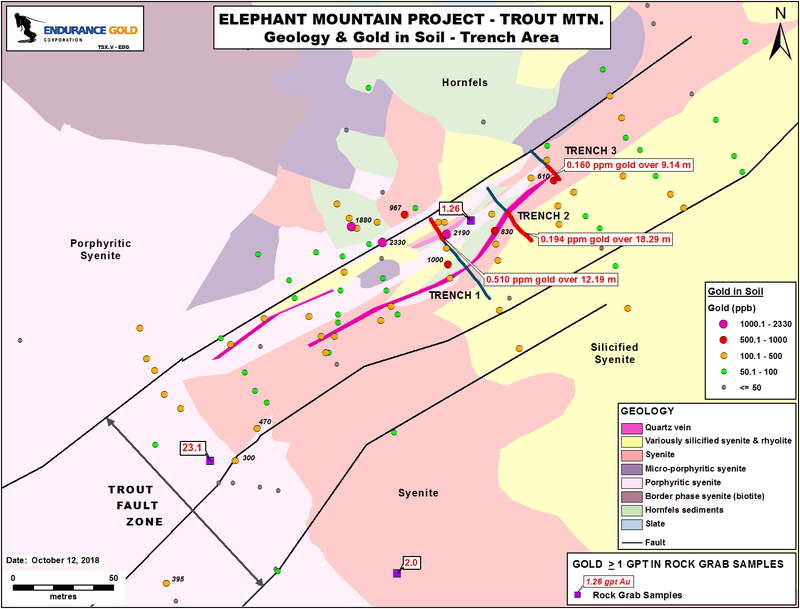 The Elephant Mountain Project controls at least six (6) km-scale gold targets associated with a Cretaceous aged intrusive complex and associated alteration that extends over a strike length of about twelve (12) km. Five (5) of these km-scale gold targets are associated with gold in soil (greater than 100 parts per billion ("ppb") gold) and rock grab samples up to 23 gpt gold. Robert T. Boyd, P.Geo. is a qualified person as defined in National Instrument 43-101 and supervised the compilation of the information forming the basis for this release. The trench channel and grab rock samples from the 2018 program were analyzed at ALS Minerals using Au-ICP21, Au-GRA21 (>10 g/t), and ME-MS41. The soil samples from the 2018 program were analyzed at ALS Minerals using Au-ST43, Au-AROR43, and ME-MS41. Confirmation standards were inserted within each sample shipment to ALS as well as ALS Minerals inserted standards with each shipment analyzed. Bedrock grab samples mentioned in this release are selective by nature and are unlikely to represent average grades within the bedrock when drilled.